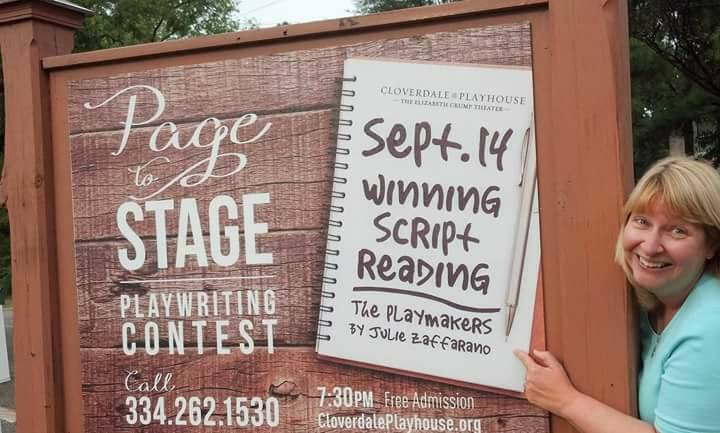 Julie Zaffarano , a Philadelphia area playwright and a proud member of the Philadelphia PlayPenn Foundry, believes everyone’s lives are made of a myriad of stories. Her award-winning scripts have been produced and performed throughout the United States. While her work spans multiple genres and forms, she is devoted to creating strong roles for women, with a special focus on women of a mature age. Most recent: The PlayMakers, produced by What If? Productions, South Carolina, 2017 (Winner in the 2016 What If? Productions Playwrights Festival Best New Work); Destiny is a Careless Waiter, Pittsburgh New Work Festival (Winner, Best Production);Turkey Baby with Juniper Productions (reading); Not So Charming, R-Act Productions; Inside Out, ReVamp Collective. Scheduled productions: The PlayMakers, Rover Dramawerks Plano, Texas, winter 2019; Naughty Marietta (Revised 2018), Rose Valley Chorus and Orchestra, spring 2019. Recent recognitions and readings: Semi Finalist, 2017 O’Neill National Playwrights Conference (Kentucky Lemonade); Winner, Maryland Ensemble Theatre (METLab) 2017 Festival; Winner Best Production, Pittsburgh New Works Festival; “Playwright of the Month,” A Work in Progress Theatre, Baltimore; “Readings at the Drake” PlayPenn (Wilma Theatre, Philadelphia); Philadelphia Dramatists Center (PDC) Playwrights Showcase; Cloverdale Playhouse, Winner “Page to Stage Contest; Kentucky Lemonade (reading), Town and Country Players; Semi Finalist, 2017 Dayton FutureFest; Finalist, 2017 Shakespeare in the Burg Contest; Honorable Mention, Ohio State University New Play Fest; Finalist, Villanova University 2016 Sue Winge Playwriting Competition; Finalist, Strange Sun Theatre Greenhouse 2016; and Semi-Finalist, Actors Theatre of Charlotte Nuvoices. Short works have been presented by Pittsburgh New Work Festival, Juniper Productions, RL Productions, Town and Country Players, South Street Players, Plays & Players, ReVamp Collective, and Everyone’s Theatre Company. Julie is a member of Philadelphia PlayPenn Foundry, Dramatist Guild, Philadelphia Dramatists Center, and the Minneapolis Playwrights Center. She holds two Masters Degrees: MA in Classical Studies and an MS in Organization Science from Villanova University. She loves spending time with her charming and supportive husband, Dave, and their growing family. Find her on the new play exchange here.